(1) HUMANITY. Marko Kloos describes his reaction to “The Münster incident”. There was a vehicle-based attack in Germany today. It happened in the city of Münster, which is where I spent much of my childhood. I went to kindergarten and elementary school there, and my family still lives in the surrounding area, so they are in the city a lot. To the dismay of some of the German right-wing party members, the attacker wasn’t a Muslim. He was a 27-year-old German with no police record, but he had a history of mental illness. So nobody gets to make much hay out of this incident–just a brain wired wrong. The perpetrator killed himself with a gun right after he had plowed into the crowd, so this was clearly a suicide that was supposed to make a statement. …But I keep looking at that picture, taken a minute or so into the incident. The first police car has just arrived on the left edge of the picture, and one of the civilians is hurrying over to them to let them know the situation. But look at the people by the van. They don’t know the background of the attack or the motivation of the driver (other than the fact that it was clearly intentional.) They don’t know if the driver is armed, or if there are explosives in the van. But before the authorities even get there, they are busy helping the injured and each other. (2) LGBTQ INITIATIVE. Inspired by John Picacio’s success with the Mexicanx Initiative, Chuck Serface has launched the “LGBTQ Initiative for Worldcon 76”. Recently, John Picacio raised enough money to send 50 deserving Mexicanx professionals and fans to Worldcon 76 happening in San Jose, California from August 16-20, 2018. Let’s replicate that success by opening the door for interested members of the LGBTQ community. Welcome to the LGBTQ Initiative for Worldcon 76! You can participate in two ways. Your donation will fund sponsored memberships for LGBTQ science-fiction and fantasy professionals and fans. We’ve begun accepting gifts already. So far we’ve gathered $1135, enough to fully fund seven memberships. Help us keep that momentum rolling! We’d like to help 50 individuals. To apply for sponsored memberships, send an email to lgbtqworldcon@gmail.com telling me about yourself and why you want to attend Worldcon 76. You must identify as LGBTQ. You can be a professional writer, artist, or any kind of performer in the science-fiction and fantasy realm. Why do you want to attend Worldcon 76? Show me your enthusiasm! You can be a fan. If so, why do you want to attend Worldcon 76? Let’s see that passion! I, Chuck Serface, will review submissions and select recipients. Please keep your statements under 500 words. I may ask follow-up questions, however. If you’re a professional, links to examples of your work would be helpful. We realize that marginalized groups have felt reticent about joining us, and understandably so. But we need more representation from the LGBTQ community in science fiction fandom! Bring it! (3) THE TWILIGHT ZONE’S PAST GLEAMING. Galactic Journey’s Natalie Devitt covers “[April 7, 1963] The Twilight Zone, Season 4, Episodes 9-12”. What is the price you would pay for one last chance at achieving a dream? That is the question that Douglas Winter, played by Robert Sterling, has to wrestle with in Printer’s Devil. Douglas is the editor of a failing newspaper called The Courier. Faced with the possibility of the paper, to which he has dedicated his life, folding, Douglas contemplates suicide. He drives himself out to a local bridge in the middle of the night, hoping to end it all there. At the bridge, he meets a mysterious stranger named Mr. Smith. Mr. Smith is played by Twilight Zone favorite Burgess Meredith. Mr. Smith offers Douglas everything he needs in order to keep The Courier in business. In no time, the paper is beating its competition to the latest scoop. In this surprisingly strong update of Faust, Douglas begins to question if his paper’s success is worth the price he will have to pay Mr. Smith, who is really the devil in disguise. (4) RULES TO LIVE BY. Stephen L. Carter shares “My own 12 rules of life: Drawn from science fiction but a good fit for reality”. Like so many other scribes, I have been inspired by psychologist Jordan Peterson’s fascinating book to sketch my 12 rules of life. But mine are different, because each is drawn from canonical science fiction. Why? Maybe because this is the literature on which I grew up, or maybe because I have never lost the taste for it. Or maybe because the sci-fi canon really does have a lot to teach about the well-lived life. Butler, of course, means this the other way around: that a society’s taste for getting rid of “wrong” ideas is a mark of its repressive nature. The time-traveling narrator is explaining the need to get rid of an inflammatory book in the antebellum South — inflammatory in this case meaning that it might spark a slave uprising. Whether the “wrong” ideas that must not be expressed are ideas we love or ideas we hate, the same mischief is afoot. Better by far for us to trust each other to draw the right answers from the wrong books…. As Bradbury notes, a crucial reason to read is that we can be surprised, upset, offended, turned in a different direction. Books at their best make us think. We don’t live in a thoughtful age, and for just that reason, reading books that challenge us has become more important than ever. When we read seriously and thoughtfully, we run the risk that we might change our minds. That’s good. One of the worst things in the world is conformity, which is another word for intellectual cowardice. (5) EVANGELIZING READERS. Here’s video from this weekend’s Science Fiction Outreach Project at Silicon Valley Comic Con. (9) RADCH AND OTHERS. Glyn Morgan, in an essay for LA Review of Books, devotes a great deal of attention to the Imperial Radch trilogy before exploring the questions “Where Have We Come From? Where Are We Going? : Identity and Self in Ann Leckie’s ‘Provenance’”. …In Provenance, too, Leckie diverts us toward quieter, more introspective fare, expanding the size and complexity of her universe while retaining the character-driven focus that has become her trademark. Indeed, much of the novel’s success or failure rests on how the reader warms to its protagonist, Ingray Aughskold. At the opening of the novel, Ingray hatches a plot to rescue convicted thief Pahlad Budrakin from the prison planet euphemistically known as “Compassionate Removal” in order to identify the location of the priceless Budrakin vestiges, historical artifacts prized by Ingray’s Hwaean people for their connection to the past. Recovering these vestiges, Ingray hopes, will give her the edge on her brother Danach in the siblings’ lifelong competition to succeed their adoptive mother, the aristocratic Netano, as heir. The Budrakin vestiges are particularly valuable because they date back to the ancient arrival of the Budrakin ancestors on Hwae. Vestiges of lesser value include party invitations, event tickets, and myriad souvenirs and mementos whose values increase with connection to important figures. It quickly becomes apparent that the Hwaean people’s obsession with vestiges goes far beyond a reverence for momentous artifacts like the Magna Carta or The Declaration of Independence: instead, it resembles a mania for collectibles and memorabilia. This mindset knowingly evokes an environment familiar to science fiction fans and attendees at conventions, some of whom pay significant sums for autographs and photographs of even minor actors from their favorite shows…. (10) HE’S ON THE COVER. At Not A Blog, George R.R. 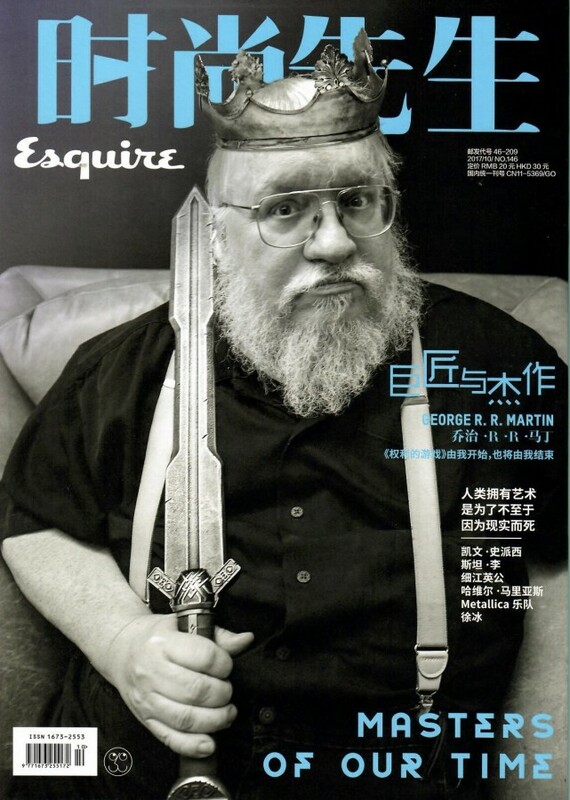 Martin shared his latest triumph as a “Cover Boy” on the Chinese edition of Esquire. The school tested the device on 10 subjects, who essentially trained the product to read their own neurophysiology. Once calibrated, the research team says it was able to get around 92 percent accuracy for commands — which, honestly, doesn’t seem too far off from the accuracy of voice commands for the assistants I’ve used. AlterEgo is a wearable system that allows a user to silently converse with a computing device without any voice or discernible movements — thereby enabling the user to communicate with devices, AI assistants, applications, or other people in a silent, concealed, and seamless manner. A human user could transmit queries, simply by vocalizing internally (subtle internal movements) and receive aural output through bone conduction without obstructing the user’s physical senses and without invading a user’s privacy. AlterEgo aims to combine humans and computers—such that computing, the internet, and AI would weave into human personality as a “second self” and augment human cognition and abilities. (12) D&D&FUD. C.J. Ciaramella admires “The Radical Freedom of Dungeons & Dragons”, a retrospective on Gary Gygax and D&D at Reason.com. D&D is a deeply libertarian game—not in a crude political sense or because its currency system is based on precious metals, but in its expansive and generous belief in its players’ creative potential. It’s collaborative, not competitive. It offers a framework of rules, but no victory condition and no end. The world you play in, and how you shape it, are entirely up to you. (13) BUT WAS IT WEARING A KILT? More on the Skye discovery: “Giant dinosaur tracks found in Scotland reveal the secrets of the Jurassic period”. The discovery is being lauded for how much it can tell us about the Middle Jurassic Period, in particular, an important time in dinosaur evolution when meat-eating tyrannosaurs and the first birds came exist. The find was made at Brothers’ Point on the north-east coast of the Island of Skye. While it is now a collection of craggy ridges and stunning rocky beaches, the area used to be subtropical in the days of the dinosaurs, with lagoons and rivers. This entry was posted in Pixel Scroll and tagged Ann Leckie, Chuck Serface, dinosaurs, Dungeons & Dragons, Galactic Journey, Gary Gygax, Glyn Morgan, Hampus Eckerman, King Kong, Marko Kloos, Mike Kennedy, Octavia Butler, Ray Bradbury, Science Fiction Outreach, Timothy the Talking Cat, Twilight Zone by Mike Glyer. Bookmark the permalink. I finished The Way of Kings yesterday and I’m not sure how I feel about it. On the one hand, it’s exhaustingly slow, and while the worldbuilding is interesting, the narrative itself spends a lot of time in what feels like a very small and limited setting (it’s also heavily male and militarised, which is no doubt affecting my judgement). That said, things picked up a lot in the last 20%, both in terms of the plot and in terms of getting characters to places where I think they might actually have a chance to shine. And I am intrigued about all these central mysteries, even if the idea of reading 9 more books of this length and ponderousness to get answers is making my stomach hurt. I might end up being compelled to read more, and that might end up being just as tortuous. This is not a great feeling. I also finished Luminescent Threads, the Octavia Butler tribute, which was enjoyable and bittersweet, as expected. It definitely benefitted from being a secondary read over a longer period of time, because some of the letters do get repetitive – this is especially noticeable at the start, where a lot of the letters talk about the political moment in the USA over winter 2016, in the space between the election and inauguration, and there are a lot of the same fears and parallels (Parable of the Talent’s “Make America Great Again” president) being repeated. I can’t fault the editors for not being omniscient or unconstrained by timelines, but I’d have loved this to have included letters written 3 or 6 months later with a different perspective on resisting in a climate of fear and intolerance. Despite that, this is a good volume, made even better by the reproduction of more scholarly analyses and articles on some of Butler’s work. Clearly I need to make time to read the Patternist books, and Fledgling too. @JJ: Elliot is neither selfish nor stupid. But he IS one of those smart people who use sarcasm and cutting truths to hurt anyone they think unworthy of their time. He gets better, and his background involves severe neglect, so I can like him despite it all — but he’s definitely NOT to everyone’s taste. That may have something to do with the authority figures in her life growing up. Her upbringing was abusive. Time of the Ghost is evidently semi-autobiographical. That’s unfortunate, and it makes a lot of sense. @Charon D.: I suspect the entity we call “Timothy” has had thousands of names over the millennia. Would one of them be Winslow? If only as an alias? @Heather Rose Jones: I don’t play Settlers enough to discuss style, but I find your discussion fascinating; I used to know a serious Monopoly and Risk player who kept notes on others’ playing styles, but that was long ago. @Contrarius: ISTM that any libertarianism the Puppies espouse is at best secondary to their desire for the rest of the world to keep in what they believe are its accustomed ways. @Doctor Science: @Heather Rose Jones’s summary matches my recollection; Pan certainly didn’t make Neverland. @jayn: @Rose Embolism has it; I’ll add that the 24/7 duty puts a hell of a lot of responsibility on someone who had minimal guidance growing up, and is probably making some things up as he goes along — or at least juggling way too many eggs without being able to be certain which ones are grenades. (@ULTRAGOTHA’s bio link supports my previous impression that she had no reason to believe that school was useful for exceptional talents.) What C needs is serious staff, which his successors might have if he trips over enough worlds’ solutions to understand it. ISTM that any libertarianism the Puppies espouse is at best secondary to their desire for the rest of the world to keep in what they believe are its accustomed ways. @Chris S: Oh yeah, I really liked Man of Shadows, which I thought was a return to form for Noon. Often hallucinatory but still coherent. (His previous novel, Channel Sk1n, was interesting, but seemed more like an outline for a novel than the thing itself.) I just picked up his new novel (also centered on Nyquist), The Body Library, but haven’t gotten to it yet. @JJ: Brennan makes no bones about Elliot being a jerk and IMHO doesn’t valorize it, but that doesn’t mean you’ll like it, of course. This book made me laugh, made me roll my eyes, made me hope, made me sad, and kept me up late at night. But I have no clue who may like it and who may not. I rec’d it to my niece, fingers crossed, but no clue whether she’ll like it. I suspect it will come down to whether I have any time left after checking all the finalists in the other categories. Bildungsromans are less appealing to me than books with adult characters. A stellar, if dense and lengthy, coming-of-age novel; those with the patience to sit through our hero’s entire adolescence will find it a wholly rewarding journey. which seems to me to be more than a bit of a back-handed compliment. I may just put Summer in Orcus on my ballot and leave the rest of the YA finalists unread and unranked — although I do want to try His Dark Materials and The Book of Dust at some point. Wow, five hours seems generous, since a lot of books seems to be 10-15 hours long, aren’t they? Well, okay, BFF (Big Fat Fantasy) tends to be longer. ? I got curious and checked — of the 15 dnfs I’ve got listed on my Goodreads account, 8 are sf and 7 are f. I would’ve thought it would be more heavily weighted to sf. Oh well! I greatly appreciate your donation to the LGBTQ Initiative! Thank you to any others who have donated, and thank you to Mike for sharing it. @ Doctor Science –RE: In Other Lands: I had the exact same reaction to Elliot! Absolutely thought of Rodney McKay as I was reading! I really enjoyed the book, and felt like Elliot was good at pushing buttons and boundaries, but he also had a pretty good idea of his own abilities. I liked the world and the other characters, and how we learned more about them as time went on. Currently reading The Collapsing Empire by John Scalzi, with City of Stairs (library) for the next one. I’m kind of skipping around depending on what I feel like reading in any given day. However, it does sound like I should get the Sanderson out of the library ASAP to get a jump on reading. Re: In Other Lands. Mr Dr Science is currently reading it, and protests, “You didn’t tell me it was FUNNY!” He’s generally of a sunnier disposition than I am, but I laugh more readily at books: if he chuckles gently, I’ll probably LOL. For this book *he* is LOLing. IOW, it’s another book aiming for the Pratchett-shaped gap in all our lives, which I realize I didn’t make clear in my review. Thanks for that link to DWJ’s brief autobiography. That was facinating. I have been sneaking peaks into it all day to finish reading it. Hey! I went to Clackamas Community College with Ciaramella. We were on the Clackamas Print together!